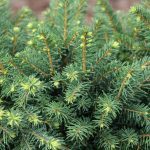 I just planted two Dwarf Alberta Spruce trees in containers. I watered them very well after planting. I want to know how often I should water. I live in central Jersey. The pots are not ceramic nor are they clay. They may be a fiberglass material; they look heavy but are not. As long as the pots have good drainage, water them about once a day in summer, 2-3 times a week in spring and fall and do not water in winter (natural rain or snow fall will take care of it).